As Quiet As It’s Kept is a multi-discipline performance installation based on the stories of veterans of color and their role in a changing community. After four years of research, community conversations, asking questions, creating and exploring, on Saturday, November 11, 2017, we presented the World Premiere of our installation performance piece As Quiet As It’s Kept (AQAIK), an exploration of home, community, and honor, while expressing hopes for belonging in a rapidly changing neighborhood. 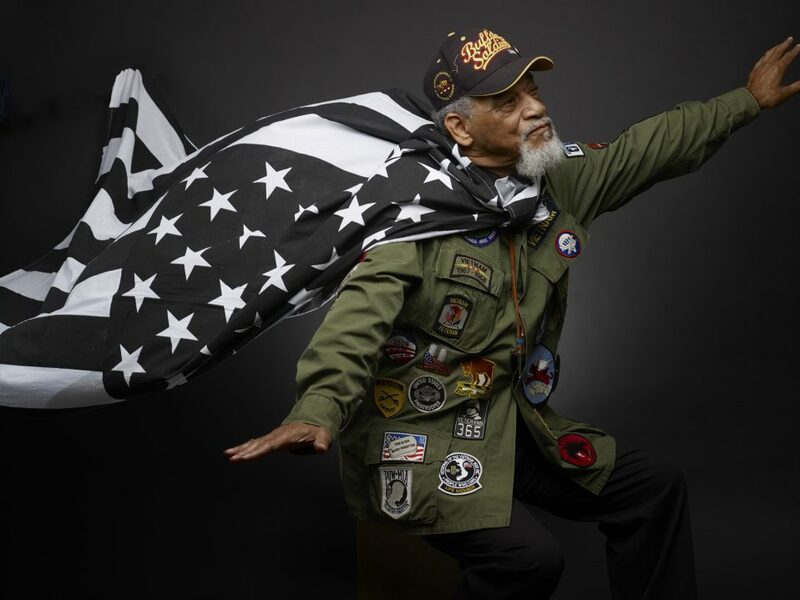 Set in 1959 and 2017, AQAIK explores the stories of community members who leave to become veterans and those who stay to become veterans of their community, the time that passes and changes that occur inside and all around them. Under the artistic direction of Monica L. Williams, six artists–Kadeem Alston Roman (choreography/dance), Zoe Flowers (writer/actor/poet), Michael Hill (guitarist/lyricist/vocalist), Anna Pond (writer/actor), DJ Reborn (soundscape artist), Robyn Twomey (photographer), through a collaborative process, created the next phase of this multidimensional work. The artists examine thoughts, feelings, perspectives gathered from local black veterans of war and veterans of the Bed Stuy community through interviews, community conversations and research. In a rigorous rehearsal process, artists work across genres to explore time and space, place and belonging through movement and sound, dialogue and internal monologue, through play-writing and poetry and by interpreting real life community members lives in a make-believe world. Each artist develops his/her own performance installation that can be experienced in isolation as well as together in a ‘concert’ of one, much like the opinions and lives of each person in the community. AQAIK was initially based on a long-term relationship between Bailey’s Cafe and the Black Veterans for Social Justice. After collecting hours of conversation with the veterans and holding interactive workshops between the veterans and youth led by Mo Beasley and Kadeem Alston Roman, we extracted themes and questions from the stories and brought them to the community to deepen the exploration and the connections between veterans of war and veterans on the home front. We are examining the words ‘warrior’ and ‘warriorism’ or the willingness to stand up for a belief regardless of the odds that also manifests as a spirit of daring or challenging expected behavior, both intellectually, creatively and physically. Other themes are: holding your/our own; being of service and returning home. AQAIK, along with other projects has unearthed lessons learned and promising practices for the organization. To capture these lessons, we will create a Community-Based Art Template that will map out replicable steps to develop and produce art for, by, about and with a specific community. his template will contribute to the place-based arts conversation occurring nationwide.